The WeatherTech FloorLiner accurately and completely lines the interior carpet giving "absolute interior protection"! The WeatherTech FloorLiner lines the interior carpet up the front, back and even up the sides of the 2017 Honda Fit’s footwell. Digital laser measurements of interior surfaces offer a consistently perfect fit! The best mats I ever owned. This will be the third set I bought. I have them on my Honda Pilot, BMW 535 and I just ordered a set for my new Honda Fit. Thank you. Ordered for a new 2017 Honda Accord Touring model with Ivory leather interior. Went with black floor mats only to match the factory (black) carpet and replace original black mats. They fit perfect and look exactly like they do on the WeatherTech website. We are exceptionally pleased. Well made but especially Made in America. We purchased the set of Laser fit floor mats for both front and back seats. Arrived much sooner than anticipated and installed all with 10 minutes total time. Money well spent! These FloorLiners are DaKine! The ultimate fit for our island FIT. They contain the mess from sandy and soggy snorkel gear, the soil and husk shells from the mac and coffee farm, the rainwater and occasional snow. Clean up is a breeze and then were set for an evening at one of the local resorts! I have been a WeatherTech customer since 2004 when I purchased a 2004 Honda Civic Si. Twelve years and 4 Hondas later. 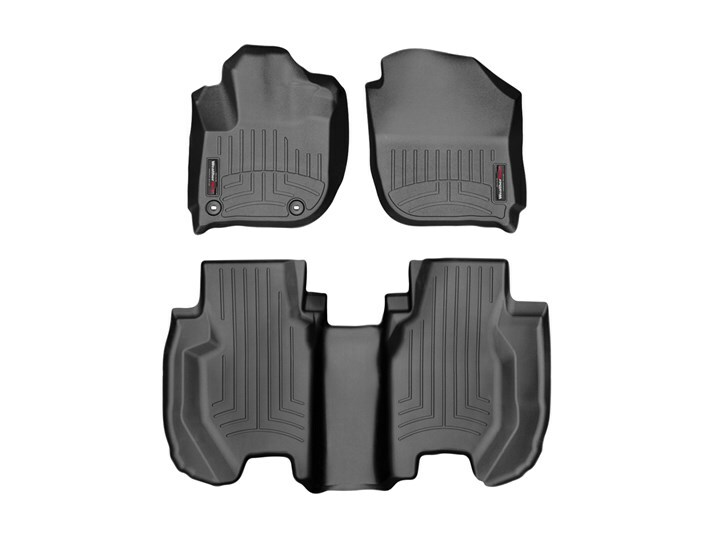 I'm in the market to purchase WeatherTech floor mats and cargo tray. My three prior Hondas had WeatherTech mats and accessories. My new 2016 Honda Fit EX will be no different. Thank you for selling such a great product! I bought the floor liners and cargo liner for my 2010 Honda Fit. I can't tell you of all the times a drink spilled, which would have badly stained my carpeting. Every year I am very thankful for the protection against the salty,dirty slush that is drug in every winter season. I just got finished cleaning my car. I washed the liners by placing them on my driveway, hosing them, and quickly scrubbing them with the soapy water I used to wash my car. After they dry, I wipe a little plastic protector on them. After 5 1/2 years, they really look as good as the first day I put them in my car. My carpet is still showroom perfect. When I purchase my next car (whenever that may be), I'll be ordering the WeatherTech package of products the first day. These products are truely the best investment anyone could make if they care about keeping their vehicle showroom worthy! Purchased the laser-scanned front and rear FloorLiners and Cargo Area Liner for my 2015 Honda Fit. The products fit perfectly and are of high quality design and manufacturing. Being USA Made is a big plus. They are well worth the investment. Thanks for exceeding customer expectations. The 2nd row Floorliner fits with no problem. Good full-width floor protection. Great product. After I purchased my 2008 Honda Fit,I realized that the Honda Brand floor mats for the front of the car offered very small coverage of the carpeting. In fact,they did nothing to protect the carpeting from water or mud tracked inside. The WeatherTech floor liners are really outstanding! They fit beautifully, are attractive and totally protect the carpet. Another quality innovation from WeatherTech!! Thanks.